At the end of 2014, the Census Bureau released 1 its 2014 population estimates. This provides new fodder for political geeks when looking ahead to the 2020 census and its major political impact: congressional reapportionment. Unfortunately, the Census Bureau doesn't release state-level population projections anymore, just national estimates 2 up to the year 2060, leaving it to others to extrapolate where the 50 states will be on April 1, 2020. The well-regarded firm Election Data Services -- you may have seen some of their big election maps -- put together 3 a set of projections and found that, if trends continue, somewhere between 14 and 17 states may gain or lose U.S. House seats after the 2020 census, as shown below in Map 1. Based on EDS's projections, California (+1), Colorado (+1), Florida (+1), North Carolina (+1), and Texas (+3) are in line to gain at least one seat. In some cases, EDS found that Arizona, Oregon, and/or Virginia may also pick up an additional seat. On the other side of the ledger, Alabama (-1), Illinois (-1), Michigan (-1), Minnesota (-1), Ohio (-1), Pennsylvania (-1), Rhode Island (-1), and West Virginia (-1) are positioned to lose a seat, and in at least one projection New York also lost one. These changes are a broad continuation of the same patterns we have seen over the last few decades. States in the South and West, mainly in the Sun Belt, continue to see larger increases in population relative to states in the Northeast and Midwest. As a result, successive reapportionments keep shifting more and more seats to Southern and Western states at the expense of Northeastern and Midwestern states, as a Crystal Ball analysis 5 from last year explored. The gains or losses are worth exploring. The biggest winner for the second straight cycle will probably be Texas, with projections showing it likely to gain three seats after it gained four following the 2010 census. Should it gain three, the Lone Star State will have 39 House members, consolidating its position as the second-largest state in the U.S. Looking further ahead, if it gains at least one more seat after the 2030 census -- a seemingly likely outcome given recent trends -- the country will have two states, California and Texas, with 40 or more representatives in Congress for the first time in its history, though the 435-seat House has only existed since 1910. Having two 40-plus states almost happened after the 1970 reapportionment but just missed: While California crossed the 40-seat threshold to 43 seats, New York fell from 41 to 39. Until 2010, California had gained at least one seat in every reapportionment since it became a state in 1850, but the latest estimates suggest that it may again add a seat after 2020. In December 2014, the Census Bureau announced 6 that Florida had surpassed New York to become the third-largest state in the union. 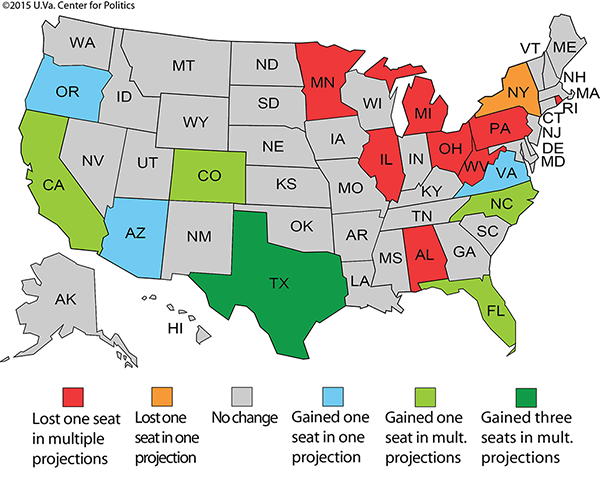 It appears that after 2020, the size of the Sunshine State's House delegation and its influence in the Electoral College will reflect that status as it will move ahead of New York by one, maybe two seats and electoral votes. The Empire State has actually lost seats in every reapportionment since 1950, falling all the way from 45 seats after 1940 to its current 27. It may well lose another seat after 2020, though it will probably be a borderline case. A seeming outlier in the geographical trend is Alabama, which may lose a seat in 2020 despite being a Southern state. However, growth in the South has been very geographically inconsistent, with states like Florida and Texas accounting for most of the region's gains over the last few decades while the rest of the South's gains and losses have largely evened out. Elsewhere, the Midwest and Rust Belt look likely to continue their downward trend. Illinois, Michigan, Ohio, and Pennsylvania are all set to probably lose one seat each; the last time that quartet didn't each lose at least one seat in reapportionment was 1970, when both Illinois and Michigan preserved the 1960 status quo. The two smallest states in this discussion, Rhode Island and West Virginia, may see their House delegations shrink after 2020. In the initial apportionment of 1789, the Ocean State had only one seat, but after the 1790 census, it moved to two seats. Except for a 20-year stint with three seats from 1910 to 1930, it has had two seats for almost its entire history. However, the state looks in danger of dropping to the ranks of the one-seat states, and if it does, Rhode Island will become the eighth state with just one representative in the House, a new all-time high. Meanwhile, the Mountain State looks like a fairly safe bet to see its delegation fall from three members to just two: It is the only state that saw negative growth between 2010 and 2014, based on the Census Bureau estimates. These changes will have many consequences. Last year, from projections based on the 2013 estimates, the Crystal Ball's Kyle Kondik took a look 7 at the future shape of the House, and most of those observations remain true in the face of new numbers one year later. Dave Wasserman of Cook Political Report recently explored 8 (paywall) the House picture as well, including some hypothesizing about where new districts might go. As for the impact on the Electoral College, the two major parties' bedrock states, California for Democrats and Texas for Republicans, both stand to gain electoral votes, particularly the latter. Recently competitive states such as Colorado, Florida, and North Carolina are all positioned to gain, raising the stakes even further in those places. Meanwhile, the historically key swing state of Ohio will see its position further reduced, and if Virginia gains a seat, the two swing states will be closer in electoral vote strength (from Ohio having an 18-13 edge to just 17-14). Other potentially competitive states such as Michigan, Minnesota, and Pennsylvania are positioned to lose an electoral vote. Obviously, the next census is still over five years away, so these estimates could still be off to some degree. But projections only get more certain as we get closer to 2020, and yet again there will be winners and losers in the reapportionment process. Changes in the level of representation for different states and in their relative strengths in the Electoral College will, as always, be politically consequential.